Fitting synthesis columns into a 96 well rack has traditionally involved pressing each column into each hole. 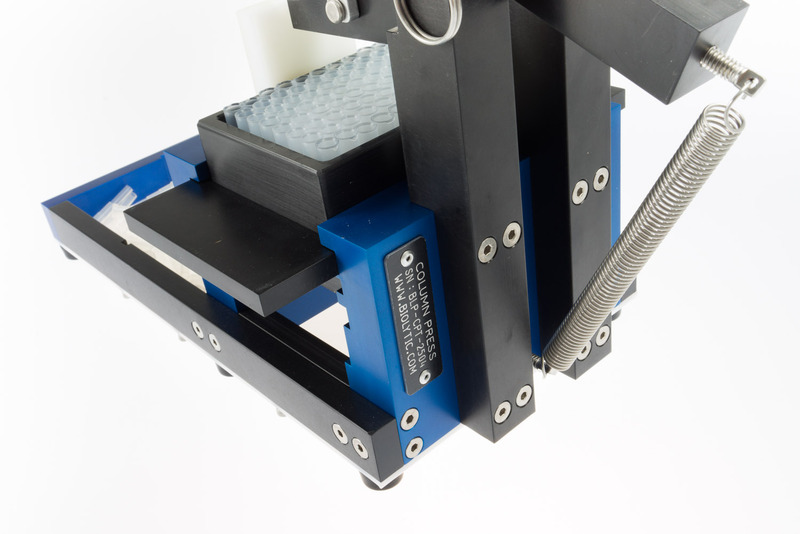 In order to create a tight seal the column needs to be flush with the top of the rack. 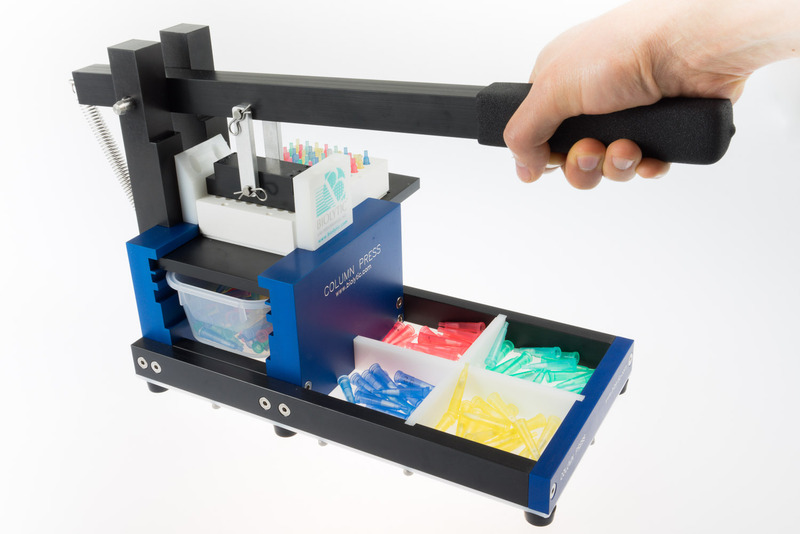 Performing this operation by hand can lead to sore fingers overtime. 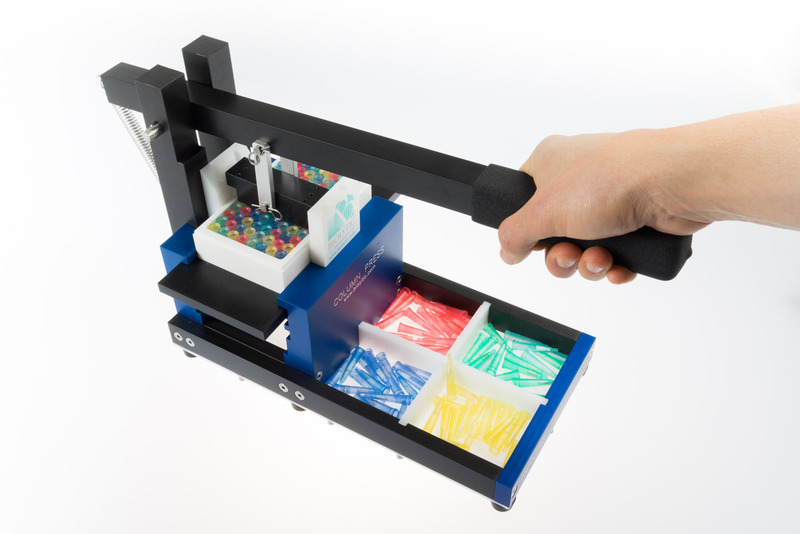 In many cases people opt to forcefully pound the columns in with a hammer. 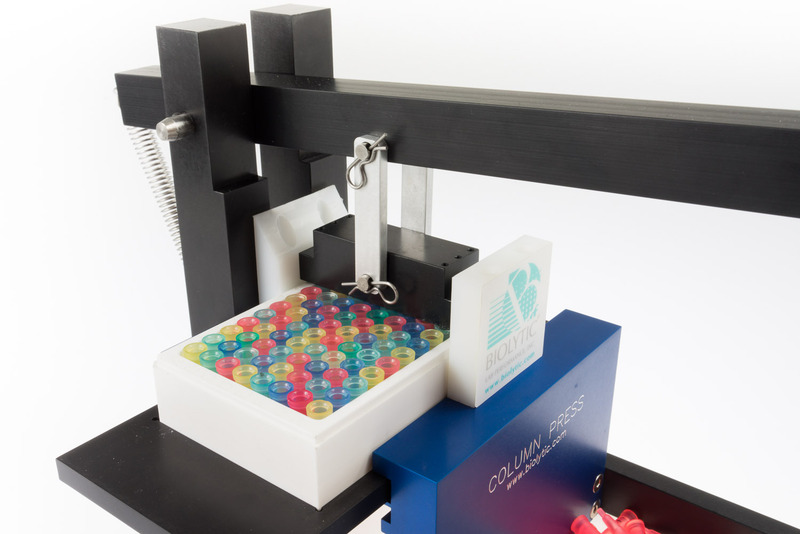 Both methods are time consuming and in the case of using a hammer, it can cause serious damage to the synthesis rack and/or synthesis columns. 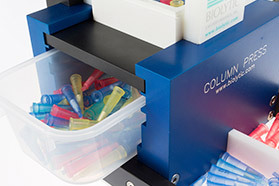 The Biolytic Column Press solves these issues with a simple economical product that allows for fast, easy fitment and removal of synthesis columns into a 96 well rack without damage to the rack or columns. 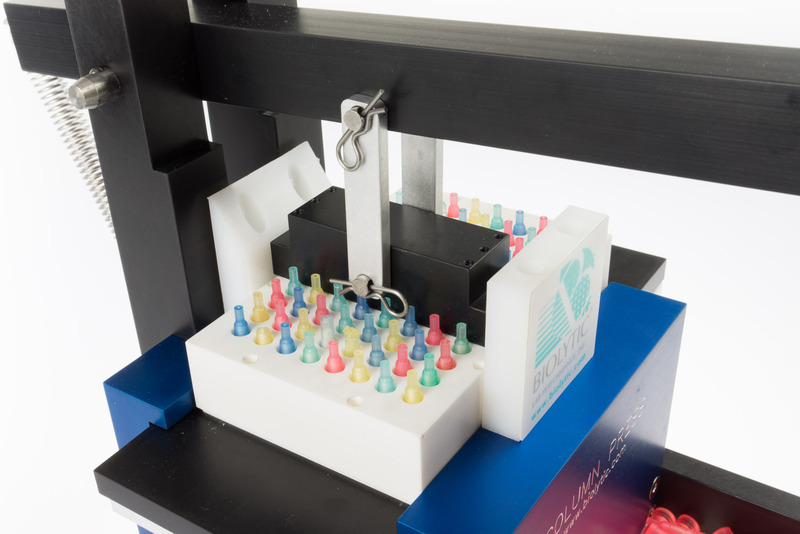 These synthesis racks are typically used in dna synthesizers, rna synthesizers, oligo synthesizers and with oligo purification. 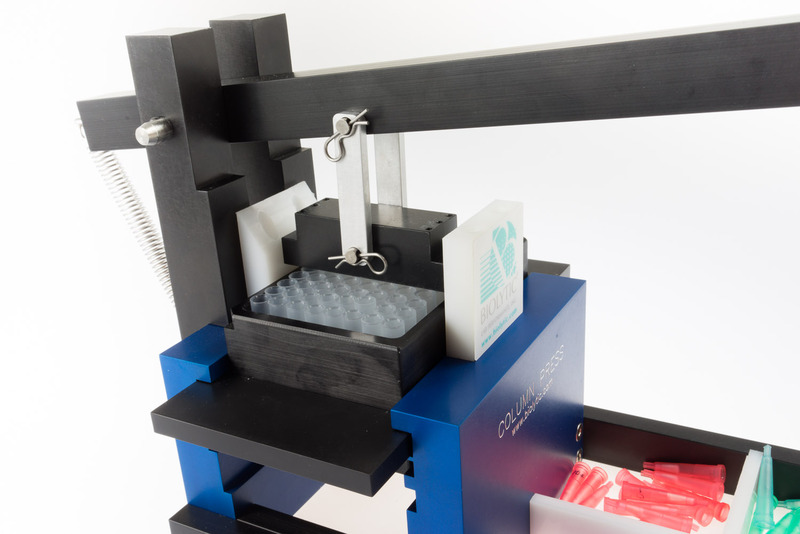 To insert columns into the rack, simply place the rack with loosely fitted columns on the removable plate and slide the plate into the column press. Position the plate so the first set of columns are properly in line with the press. Push down on the handle until the columns are firmly seated. 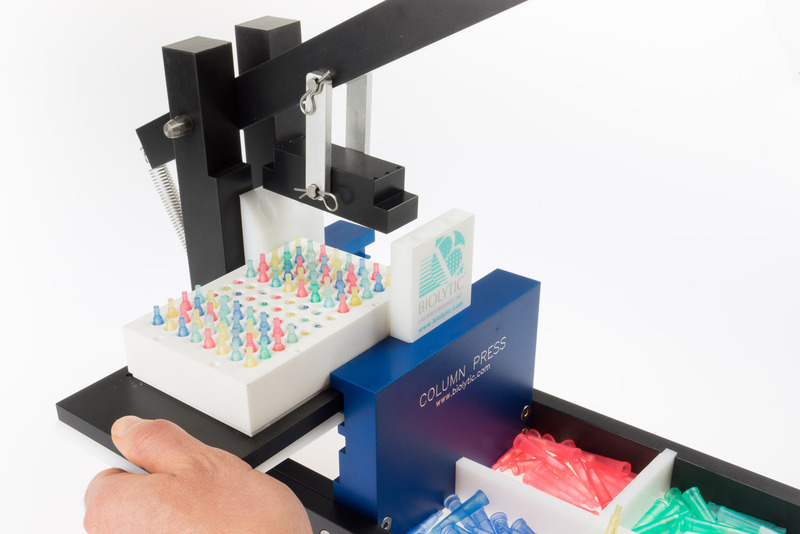 Repeat the process until all the columns in the rack have been pressed. 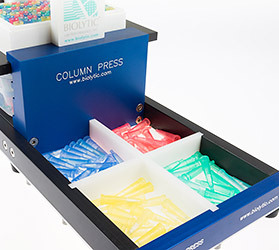 The Biolytic Column Press provides fast easy fitment and removal of synthesis columns into a 96 well rack without damage to the rack or columns. Removing columns from the rack is a very similar process. 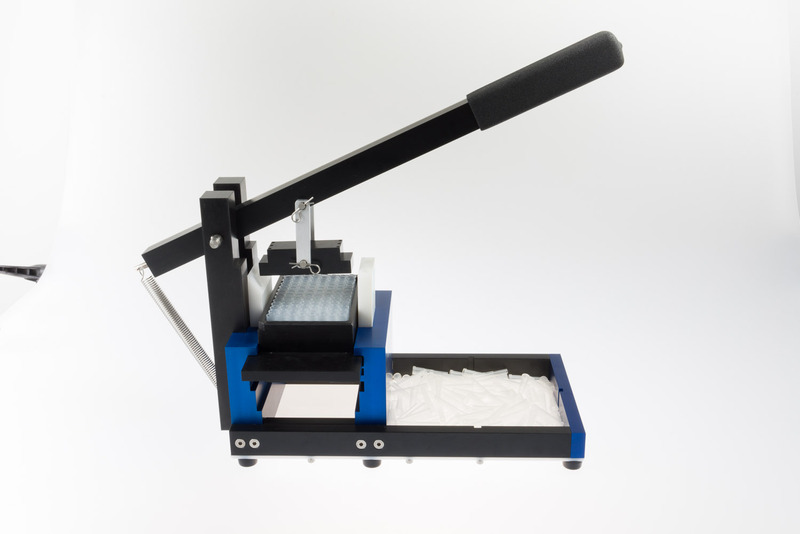 First, place the rack upside down on the removable plate and slide into the column press. Position the plate so the first set of column tips are properly in line with the press. Push down on the handle until the columns are released into the slide-out bin underneath. 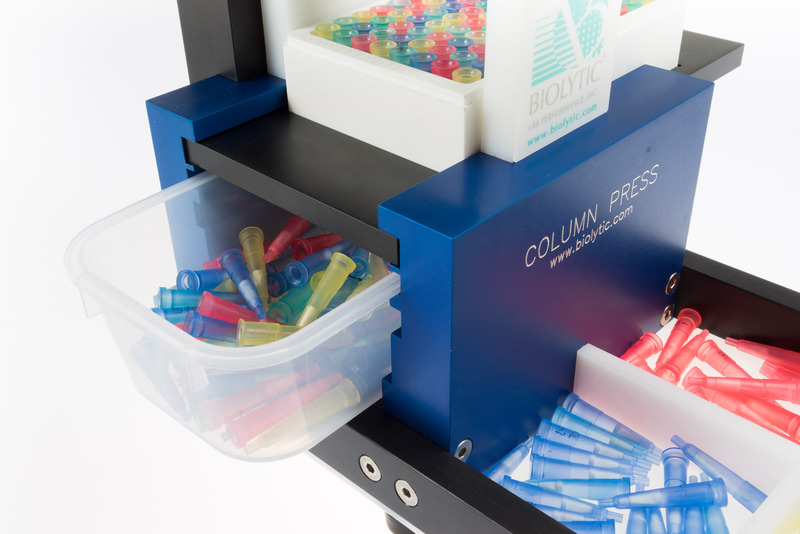 To keep track of each column when synthesizing different types of oligos, the included plastic shim can be used in place of the slide out bin to allow the columns to be removed but kept within the rack. In the front, there are four small compartments to store spare columns. If you prefer it can be converted to a single large compartment. With its wide base and solid aluminum frame, it is engineered to last for years of use. 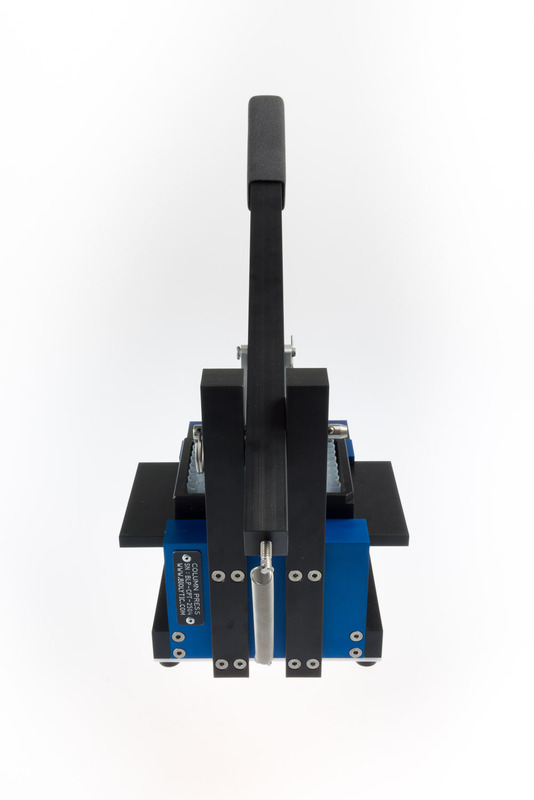 And, at only 16 inches long and 6.5 inches wide, it provides a compact footprint for even the smallest of labs. 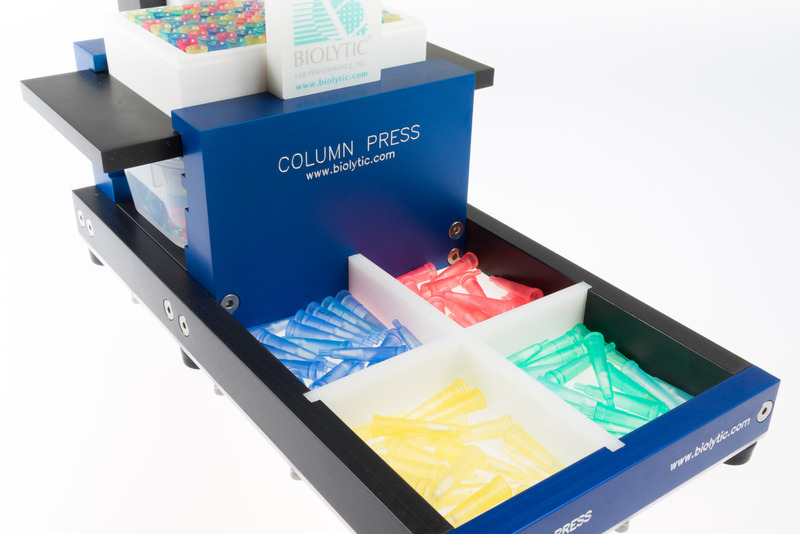 The Biolytic Column Press is mainly used in dna synthesis and can be used to insert standard support or universal support 3900 style columns, Glenpak OPC cartridges and CTGen Activa Frit media into a 96 style rack. 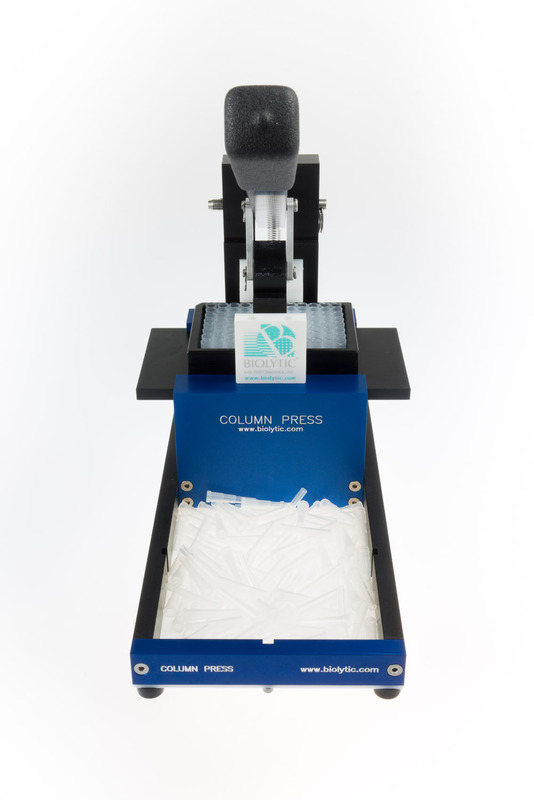 The column press is also compatible with the racks used in the Dr. Oligo Synthesizer and Dr. Oligo Processor. For more information on rack compatibility please contact us directly. Dimensions 16" X 6.5" X 18.5"
Manufactured Made in the U.S.A.